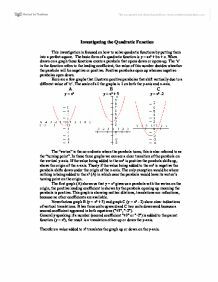 This investigation is focused on how to solve quadratic functions by putting them into a perfect square. The basic form of a quadratic function is y = ax² + bx + c. When drawn on a graph these functions create a parabola that opens down or opens up. The ‘a’ in the function refers to the leading coefficient; the value of this number decides wheather the parabola will be negative or positive. Positive parabolas open up whereas negative parabolas open down. 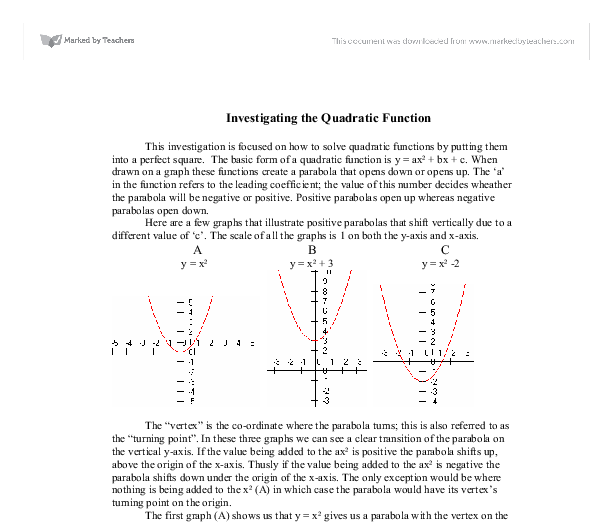 Here are a few graphs that illustrate positive parabolas that shift vertically due to a different value of ‘c’. The scale of all the graphs is 1 on both the y-axis and x-axis. The “vertex” is the co-ordinate where the parabola turns; this is also referred to as the “turning point”. In these three graphs we can see a clear transition of the parabola on the vertical y-axis. If the value being added to the ax² is positive the parabola shifts up, above the origin of the x-axis. Thusly if the value being added to the ax² is negative the parabola shifts down under the origin of the x-axis. 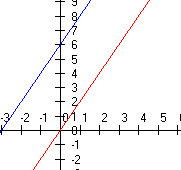 The graph shows the x value to be –3 whereas the value being added to x is +3. So we see that positive values added to x will always end up negative therefore the opposite, all negative values, will show positive values on the x-axis for the parabola. If the form ‘y = (x + b)²’ is modified to ‘y = a(x + b)² + c’ this is now “turning point form”. We already established that adding values to x² will move the vertex of a parabola up and down the y-axis. So to get the basic shape of a parabola first find the vertex by moving ‘h’ to the right and ‘g’ up, then substitute ‘0’ for ‘x’ and work out what ‘y’ will be to get the y-intercept. Once the y-intercept is found a curve can be drawn from the vertex to the y-intercept and since the line is a reflection through the line of the vertex the other side of the parabola can be draw as well. Some of the rules that apply to all the forms discussed in this investigation also apply to other forms. To translate a linier function on the y-axis you add or subtract a value directly to x just like mentioned before. The slope will stay the same but the interception of the y-axis will be different as the value implied on x changes. 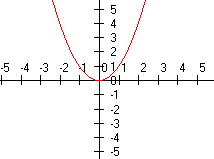 If x is raised to any even number the parabola will observe the exact same rules as x². 18a + 2b = 5 18 x 1/6 + 2b = 5 3 + 2b = 5 2b = 5 - 3 2b = 2 b = 2/2 b = 1 Substitute a = 1/6, b = 1 into equation 6. The graph y=f(x) is shown: There are three visible roots to the equation. I will take an approximate root for the root in interval [2,3] to be 3. As I shall explain later, the Newton-Raphson iteration will hopefully converge to the root in interval [2,3]. Graph 2 - Will cross the x-axis at (0,2) Graph 3 - Will cross the x-axis at (0,-2) Graph 4 - Will cross the x-axis at (0,2) Graph 5 - Will cross the x-axis at (0,-2) Results Graph 1 Graph 2 Graph 3 Graph 4 Graph 5 As you can see from all the results my predictions were correct.